If you are interested in joining us for a wonderful week of wool based craft, get in touch! Join us for a week of woolly craft in the Scottish Highlands. The week starts with Alex hand-shearing one of our Sheltand sheep, followed by a session learning about fleece, sorting and washing fleece. We then spend a couple of days foraging for dye plants and making natural dyes from foraged plants, home grown plants and ancient imported dyes. Once we have made a stunning rainbow of coloured fleece, we are ready to felt with it! Firstly we take a day out and enjoy some of the stunning local scenery..including walks in Glen Affric. 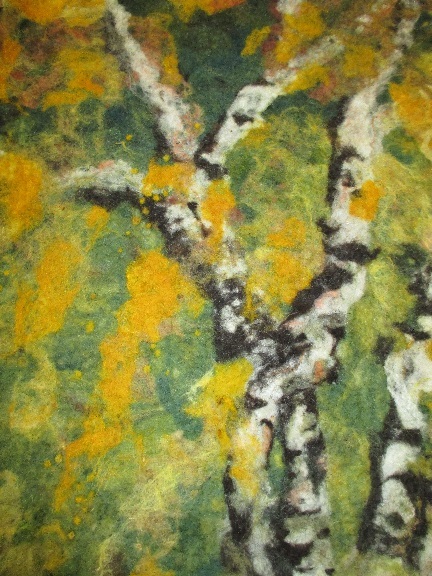 Our last few days are spent felting with the beautiful fleece we have naturally dyed. Often guests choose to make large wall hangings inspired by the stunning landscapes they have visited over the week. Guests stay at Kerrow house, which is a lovely old fishing lodge, set next to the River Glass. We provide all the meals and love to cook, we source as much as we can locally and grow most of the salad and greens at home. Wake up to home-made bread and a relaxing atmosphere! We pick all our guests up from Inverness, which can be easily reached by train, bus or plane.